The email arrived in my inbox the other day from the folks at Sky Golf. My SkyCaddie membership was expiring and the email was a friendly nudge for me to open up my wallet. I was a pretty early adopter to the world of golf GPS units. I initially got a GolfLogix device in 2007 or 2008. It served me well until I managed to have it fall off of my push cart during a round at Woodhill, land screen side down and break. That’s when SkyCaddie and I became tight. I needed my GPS fix and SkyCaddie was there for me. I’d load up my device, clip it to my golf bag and I’d get my distances. Each spring, I’d happily pay the folks at SkyCaddie my membership fee and we’d go steady for another year. But every year it became harder to pay up. The membership fee felt more like a ransom. And I grew so very tired of going through the process of loading courses on the device. So last fall I had enough and I cheated on my SkyCaddie. On Black Friday, I picked up this bad boy on sale at Golfsmith. What is it? It’s the Garmin Approach S1 GPS. It isn’t the fanciest device — there are actually now two different Garmin watch devices with a couple more bells and whistles and a higher price tag — but it works just fine for what I need. I used it for several rounds last November in Phoenix and for four more rounds this week in Arizona and I’m certainly satisfied with the unit. The best thing about the device is that there is so little pre-planning involved, it is very low maintenance. I simply show up at a course, turn on GPS part of the watch and magically the watch knows where I’m at. I don’t have to turn on my computer, pull up the synching software, find the courses I’m going to play, find the cord, hook it up and make the data transfer like it is 1997. The information provided on the watch is admittedly not as complete as what I could get from my SkyCaddie. I get simply distances to the front, middle and back of each green. That’s it. There are no layup numbers, no distances to the water on the left or the bunker on the right. I don’t get an accurate rendering of the green. But I can live without that information. I’m much more interested in the convenience. When I was considering the device, I had some concern about playing while wearing a watch. I don’t remember ever golfing with a watch. While the GPS unit is much bigger than the watches I use on a regular basis, it’s comfortable and really only felt weird the first round or so. Now I don’t even notice it while I’m swinging. I have supplemented the GPS watch with a used (and kind of beat up) Laser Link Golf Quick Shot unit that I purchased on eBay for about $30. The unit is so old school that it only works on pins with reflectors and is useless if if you want a distance to a tree or a bunker, but I can live with that. My home course has reflectors as do many nice courses (I’m currently 3-for-4 on this Phoenix trip). 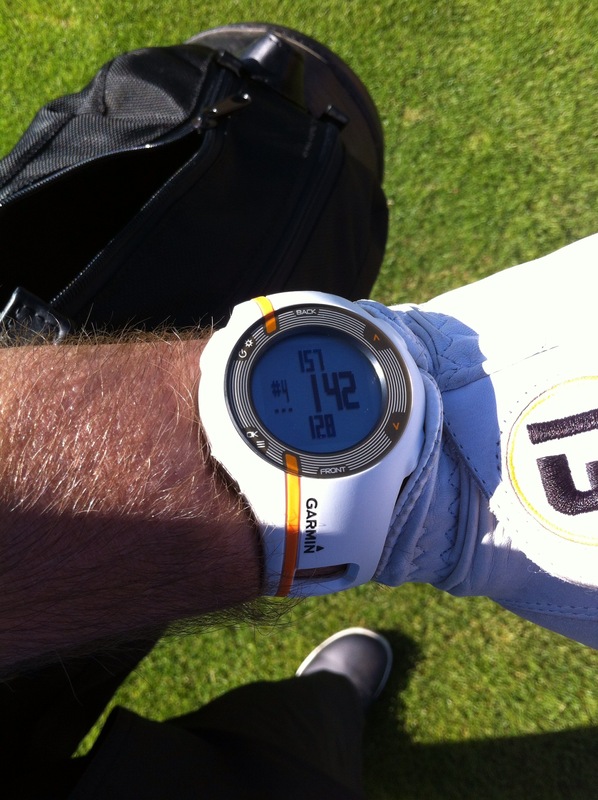 I do realize that SkyCaddie recently launched their own watch unit along with a new handheld device. But that didn’t happen until I was moving into a new world. The Garmin watch works well and seems accurate (the only downside is that getting the charging piece properly attached can be a little tricky). If you are looking to find a GPS unit that is easy and low maintenance, don’t be afraid to try a watch unit. It’s a good option and one that was good enough for me to breakup with my SkyCaddie without feeling guilty. So sorry SkyCaddie, we’ve totally broken up. Garmin is biggest company in golf truowngfmarket now, just like Apple. And SkyCaddie just like Nokia or Blackberry, they don’t update fast enough to adapt to that innovation.